Hearts of romaine lettuce lightly tossed in dressing, with fresh Parmesan and croutons. Fresh mixed greens, shredded carrots, grape tomatoes, cucumber and red onions. Kale, pistachios, dried cherries and parmesan tossed in lemon vinaigrette. Iceberg lettuce with tomatoes, blue cheese, red onions and bacon. Crispy battered green beans with our Tug’s Pub aioli. 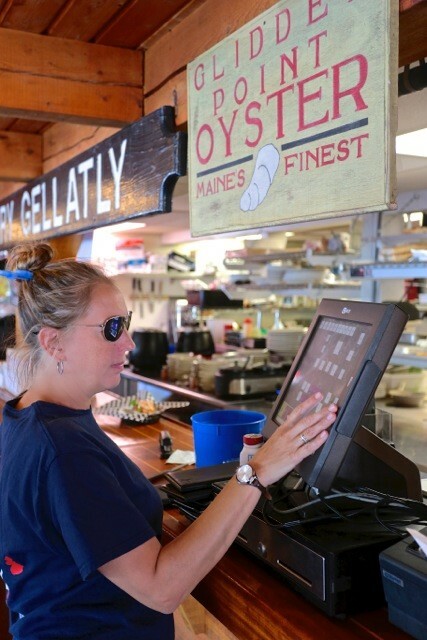 When available, 6 fresh and local oysters served on the ½ shell. Tortilla chips topped with melted cheddar cheese, diced tomatoes, shredded lettuce, onions, jalapenos, black olives and fresh cilantro. Fried golden brown. Served with marinara sauce and lemon. Native lobster and crab baked in a Newburg sauce. Served with warmed bread and tortilla chips. Choice of BBQ, buffalo or sweet chili sauce. Grilled tortilla with cheese and fresh picked lobster meat. Sautéed with garlic, white wine, parsley and tomato. Served with bread. Pancetta, balsamic infused apricot and cranberry. 6oz seared sushi-grade yellowfin tuna topped with a seaweed salad and wasabi cucumber sauce. Chef’s choice of fresh ingredients. Ask your server for today’s selection. With mayo on your choice of white, wheat or rye bread. Fresh in-house picked lobster mixed with a touch of mayo over lettuce. Served on a toasted roll. A generous portion of fresh picked lobster, sautéed in butter, served with starch and vegetable of the day. Served with corn on the cob and coleslaw. Choose from 1 lb., 1¼ lb., 1½ lb., Twin 1 lb. Start with a cup of chowder, followed by 1¼ lb. lobster, steamers, corn on the cob and coleslaw. Served with chips and a pickle (except Haddock Tacos). French fries +2, sweet potato fries +4 or tater tots +4. Generous portion of haddock fried or broiled with lettuce and our house-made tartar sauce. Served on a Kaiser roll. With cranberry mayo on your choice of white, wheat or rye bread. Blackened or fried with your choice of roasted corn salsa or cilantro slaw with a side of our Tug’s Pub aioli. Shaved steak with mushrooms, peppers, onions and choice of cheese. Served on a baguette. Freshly sliced pastrami, Swiss cheese, sauerkraut and Thousand Island dressing. Served on rye bread. Fried or grilled with lettuce, tomato and onion. Served on a Kaiser roll. 8oz ground sirloin with lettuce, tomato and onion. Served on a Kaiser roll. Served over linguine with a side of garlic bread and a house or Caesar salad. Sautéed chicken breast with mushrooms, marsala wine and a hint of cream. Topped with tomato and scallions. Lobster, shrimp and scallops sautéed with garlic, white wine and parsley. Served over linguine with a side garlic bread and a house or Caesar salad. With seafood stuffing, finished with lobster Newburg. Served with starch and vegetable of the day. With lemon herb butter and a cracker crumb topping. Served with starch and vegetable of the day. Pan-seared scallops topped with lobster and crab Newburg. Served with starch and vegetable of the day. Scallops, shrimp and baked haddock with lemon herb butter and a cracker crumb topping. Served with starch and vegetable of the day. An American favorite, char-grilled. Served with starch and vegetable of the day. Haddock lightly breaded and fried, served with French fries and coleslaw. Lightly breaded and fried, served with French fries and coleslaw. * This food is or may be served raw or undercooked, or may contain raw or undercooked ingredients. Consuming raw or undercooked Meat, Poultry, seafood, shellfish or eggs may increase your risk of foodborne illness, especially if you have certain medial conditions.